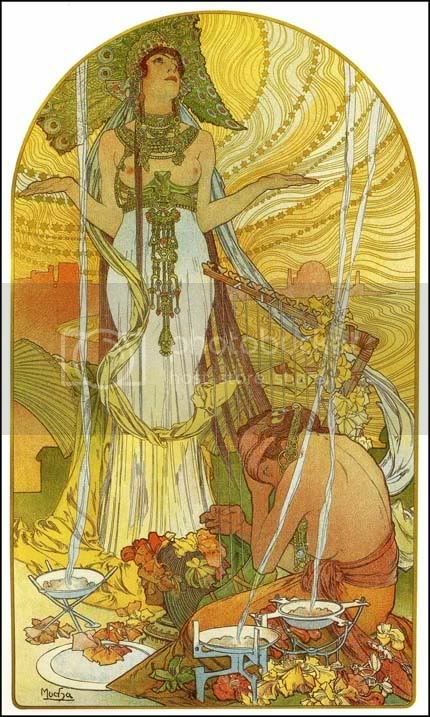 Alphonse Mucha played Empire of the Petal Throne. Beware! The forest is infested with Crocaparrots! 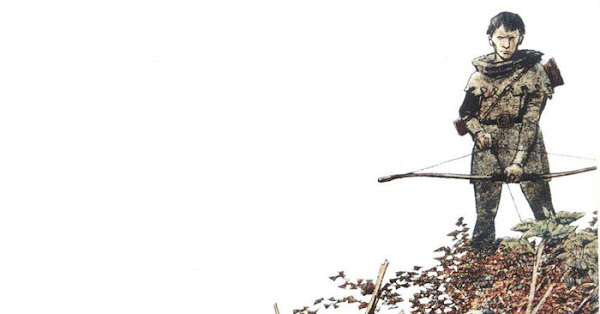 I found this image at Worth 1000, a site devoted to photoshop images. They have theme contests all the time and this was from a make a combined animal contest. As soon as I saw it I thought, yeah, I'm gonna have to write that up. The Crocaparrot was created in a jealous pique by a wizard who was envious of the mage responsible for the far better known Owlbear. Crocaparrots roost in dim tropical and semi-tropical forests near water sources. A flock of hungry crocaparrots will not fear to attack any group of creatures man-sized or smaller which does not greatly outnumber them. They do, of course prefer to go after single creatures alone. 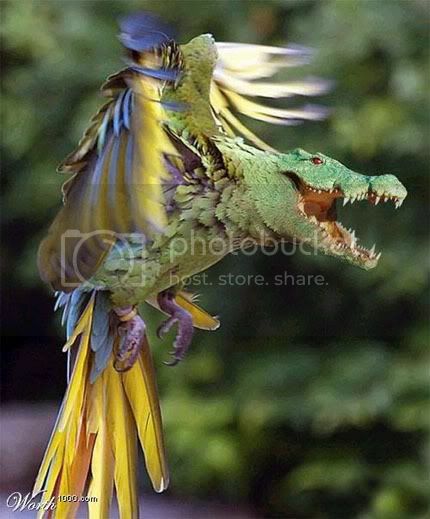 Crocaparrots are not quite as intelligent as a regular parrot, but they do retain the normal parrots ability to mimic other creatures they have heard. They are just smart enough to use this ability to attempt to draw out and separate possible victims from a larger group. Hidden in the forest canopy, or among the under growth crocaparrots may repeat words or phrases that they have seen people react to in the past. Phrases such as, "Save my baby! ", "I've found the treasure! ", or " Hey, sailor!". If characters react to the crocaparrots lure, searching for the source of the voices in the trees, the crocaparrots will mob one or two of them at a time, biting with their powerful jaws. During the attack, the crocaparrots will often repeat the words and cries of previous victims in their high, but gravelly voices. "Rawwwk! What the hell is that?! ", " Aahhhhgghh! Get it off me! ", "Hey, what happened to the halfling?" Once a crocaparrot has bitten it's victim, there is a 2 in 6 chance it will hang on instead of letting go. If it does so, it will execute a "flying roll" in the next round, spinning in the air using it's wings and tearing off a chunk of flesh. This will do 1-6 damage for that round. Should the flock successfully kill it's victim, they will work together to bear the dead creature up into the canopy and wedge it's body in the crotch of a tree. Crocaparrots prefer to let their meat age until it has softened since their teeth do not allow for chewing. 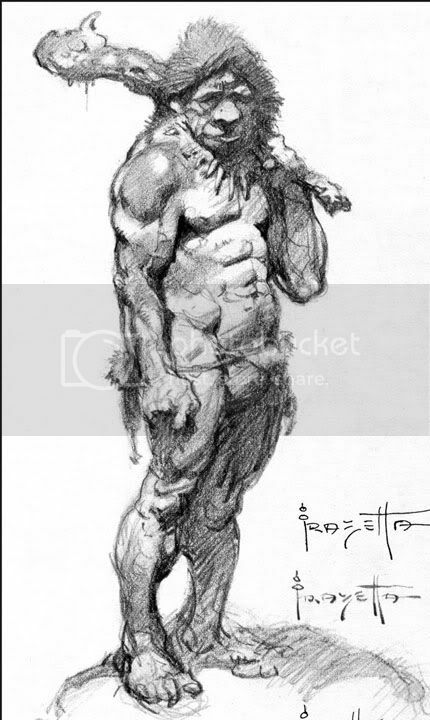 This is clipped from a 1971 convention sketch by Frazetta. A recent post by James Malizewski at Grognardia brought this image to mind and I thought I'd share. I'm a nice guy like that. The post was called Myth Busting, you'll have to go back and dredge for it your self cause my links often don't work. Though, since it racked up 66 comments pretty quickly, I bet you've already read it. I only have a few blogs here on the sidebar at Old Guard, but my gaming related favorites on internet exploder takes almost a ten count to scroll all the way through, I can't check them all every day, but Grognardia is a daily read for me. Anyway, Myth Busting was about the perceptions of old school gamers by the newer generations. I can't say myself what goes on in other peoples heads, I'm multi-tronic myself, so things that are apparently unrelated to whatever conversation I'm having at the moment sometimes pop out of my mouth and confuse others, since I'm running other trains of thought concurrently. Snerk. My old school is big, really, really, big. I'd describe how big, but I forget the rest of that Hitchhikers Guide quote. I like to read the perpetual discussions online of what exactly constitutes Old School, I'm always picking up new perspectives and bits of history that I hadn't been aware of before, and that's fun. The thing is, I think that what makes the difference between old and new is not what's included in the old, but what's excluded from the new. Original, Advanced, even 2e, were open, huge, unlimited in scope. I'm not talking about mechanically, I mean the attitude toward what could be included in the game. Fantasy of every flavor, science fiction, popular entertainment of whatever description, war gaming concepts, tv and movie ideas etc. Nothing really was excluded from possibly making an appearance in your game. Just as it was with early science fiction and fantasy literature, there wasn't a clear dividing line between what was permissible in D&D and what wasn't. I think that is a strengh, not a weakness. The abstract nature of the rules lends itself to an expansive perception of just what the game is. That's why, while I'm interested in how others define old school play, I'm not interested in seeing any single definition be accepted generally by all. If you perfectly define a thing, you kill it. If it can no longer change, or grow, or contract, it is static and it will be left behind and forgotten eventually. That's why I like to see you guys fight. Not because I want to see discord for it's own sake, but because it means there is life still in the Old School. And even if sometimes there are hurt feelings for a bit, the ideas churned up by the conflict spark new lines of thought and feed the fire of innovation. I prefer, of course, to discuss ideas with the like-minded, just like everybody else. Like-minded doesn't mean hive-minded though. I'm not going to gain anything by talking to myself in a mirror. What I see as being the main difference between the old and the new is the degree of definition assumed by the rules. Old School is deliberately vague on many issues, and that's what keeps it alive. It can still change, grow, Adapt!, Improvise!, Overcome! Sorry, I worked with a marine once, and it kinda gets on you. The new stuff is so rules burdened that it's D.O.A. in my eyes. It is defined right into the grave. This is how you do that, that is what happens then, always use the optimal mechanical option so, and there, we're done, game over, see you next week. They can put out as many new expansions as they want to give it the illusion of flexibility and thus life, but when they reach saturation point, they can only put out a new edition and start over. I'm not attacking adherents of the new. I don't see any point in it. It somewhat irks me that Wizards of the Coast puts out a game they can legally call Dungeons & Dragons when it really isn't, but the fact that it isn't means that the friction between the Old and the New just doesn't have any great traction with me. Sure, I'll kick Wizards of the Coast in the balls occasionally, they deserve it, but there's no deep malice in it. They're like the SYFY channel of gaming. not nearly as interested in gaming as in gamer's dollars. In my own comment on Myth Busting, I said that I saw Old School gaming as radical gaming, in the original meaning of the term. Of the Root. Old School is roots gaming, the starting point from which your own game can grow in any direction you wish. It means you aren't limited by what's official, or whats in the newest expansion, or what stack of abilities you need to get the kewl powrz. It means you can mix and match and tear down and rebuild your game in any number of ways and any number of times however you like. You can draw inspiration from any source and pull rules from any of your fellows. Accepting Old School rules means you don't have to play by the rules. Man, my fingers are tired, I've been laying tile all day, how the hell does Malizewski do this every day? 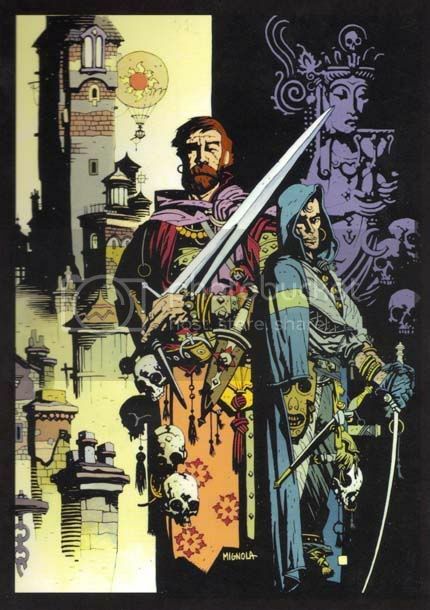 Mike Mignola's take on Fafhrd and the Gray Mouser. From the author's forward to Ill met in Lankhmar, by the mighty Fritz Leiber. "This is Book One of the Saga of Fafhrd and the Gray Mouser, the two greatest swordsmen ever to be in this or any other universe of fact or fiction, more skillful masters of the blade even than Cyrano de Bergerac, Scar Gordon, Conan, John Carter, D'Artagnan, Brandoch Daha, and Anra Devadoris. Two comrades to the death and black comedians for all eternity, lusty, brawling, wine-bibbing, imaginative, romantic, earthy, thievish, sardonic, humorous, forever seeking adventure across the wide world, fated forever to encounter the most deadly of enemies, the most fell of foes, the most delectable of girls, and the most dire of sorcerers and supernatural beasts and other personages." 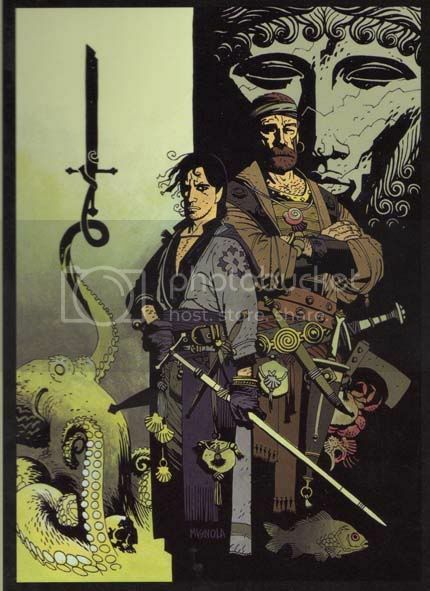 As much as I love Conan, and John Carter, and Elric, Fafhrd and the Gray Mouser are my favorite Sword and Sorcery characters. They are the most human and true-feeling to me of any such heroes in the genre. They are rife with human failings and needs, and at the same time, capable of those split-second moments of brilliance when we surpass our limits and accomplish those things we shouldn't quite be capable of. Fritz Leiber's grounding in Shakespearean theater is probably what gave him the insight into human character that allowed him to create the two greatest swordsmen in all Newhon. The art shown here is from the dust jackets of the White Wolf editions of Leibers stories published in 1995. Probably the best thing White Wolf ever published. There hasn't been a whole lot of art depicting Fafhrd and the Mouser done. No where near the amount that that glory hog Conan gets, or even that pasty drag queen Elric. I'm kidding, I'm kidding! I love Melniboneans, really. You probably know Mignola more for Hellboy and related comics than anything else, but these covers are my favorite pieces of art from him. They have a deep, moody atmosphere that meshes perfectly with the Fafhrd and Gray Mouser stories. They stink of Lankhmar, City of Sevenscore Thousand Smokes. Mignola also did black and white decorative illustrations for chapter headers in this edition, but not action illustrations, like like the great little scenes that Frazetta did for the John Carter books. That's a shame, because they would have been great to see. I doubt we will see so much small job illustration from Mignola in the future. He's going the way of Frank Miller now with the success of the Hellboy movies. Let's just hope he doesn't decide to do a comic series with a psychotic, ranting Batman too. 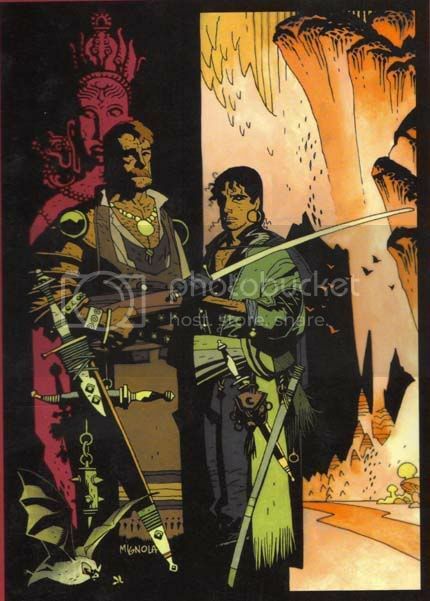 I think it was Dark Horse comics which did a Fafhrd and the Gray Mouser adaptation series with Mignola as the artist some time ago. Hmmm, was that the late eighties? I don't think I have a copy of that in the comic archive, though I'd like to find a clean one. I don't know if it has been reprinted recently. They should though. Fafhrd and the Mouser have never made it to the tv or theater screen, and while, theoretically, I'd love to see that, I know it wouldn't come out very well. They just never do, do they? If the stories were FAITHFULLY adapted, with Shakespearean quality actors, and solid effects, and not kiddified, or "updated", or "reimagined", or neutered, they would be the most powerful sword and sorcery on film. I know full well that this will never happen, so I'm content to let them remain print and art only. If hollywood, or,horrors, the syfy channel got their clumsy, grasping paws on Leibers work and gave it the rewrite treatment, I'd have to take my broadsword and go out there. I have a woodworking blog also, and one of my longer term plans will be for a ridiculously ornate wooden Dungeon Masters screen. I've had great luck with incorporating printed art into furniture projects, and I think these three images, interspersed with some Frazetta Conans, and Gould Elrics would make for an excellent art wall for the outside of the screen. I think it would really reinforce the pulp origins and feeling of The Game for the players. Creating that atmosphere of danger and adventure is conducive to good gaming, I think. Consider it a wall of role(roll?)models. I'm considering making this guy my blog mascot. It always looked to me like he was saying something in the monster manual illustration, and I thought it would be entertaining to put words in his mouth. "Get off my lawn!" was just the first, and most grognardly thing to pop in my head. I also like , "You're doing it wrong! ", and "Kneel to the eye tyrant of fun!" I'm going to call him Eyegor. As with the ditch archer from the previous post, I like to twist old monsters to make them unexpected. Especially the old classics that everyone thinks they've got nailed down. On the island of the mad transmogrophist Uaerom, I had lots of creatures resulting from the wizards attempts to improve on creation. Hybrids, fusion monsters, and what not. This was of course, for Hackmaster, so over the top weirdness is encouraged. I'm going to put up three more of my favorites from that build. The gelatinous sphere is a nocturnal, surface dwelling version of the more well known gelatinous cube. The sphere is just slightly more intelligent than the cube, and a more active hunter to the cubes roll of scavenger. Nearly transparent, with a slight green tint, the sphere rolls about the forest and countryside at night, looking for both dead and living animal matter. Though it can be hurt by fire, the gelatinous sphere is not afraid of it. It is dimly aware that easy meals may often be found sleeping peacefully beside a campfire. The sphere makes almost no noise when is slowly rolls out of the night and on top of an unwary camper. 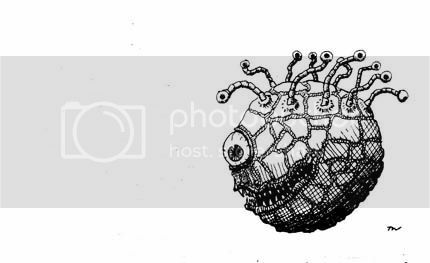 If encountered by an active party, the gelatinous sphere is 100% likely to attack, rolling at it's top speed to chase down and engulf fleeing victims. Those who come in contact with the sphere must save vs paralyzation or be immobilized, and then sucked within to be dissolved. Unlike the cube, the gelatinous sphere will have a lair. This will be a location mostly hidden from the sun, where it can wait out the day, and digest it's prey. Before entering it's lair, the sphere will exude a sticky goo and roll about coating itself in leaves, sticks, and debris as camouflage. While in the lair, any indigestible materials the gelatinous sphere has absorbed during the day, will be expelled. Adventurers stumbling upon a ring of metal objects and gems in a dim wood should be wary. Death may come rolling and bouncing upon them at any moment! All weapons can damage a sphere. Electricity, fear, holds, paralyzation, polymorph, and sleep based attacks have no effect. These next two are unique creatures created by Uaerom in his madness. He abandoned them to roam the island, considering them failures. Special attacks: weakness causing poison on hands. Guk is a horrific fusion of a man, and a roper. An abomination, Guk stands on hairy, human legs and has human hands on the ends of his six tentacles. He has otherwise the features of a roper, save for a luxuriant head of red hair. He shouts his name when attacking, "Guk!, I Guk! ", and sometimes asks nonsense questions of his victims during the fight. Guk stands in the opening of his home, a shallow cave, on moonless nights and waits for something edible to venture within reach. (5") When scoring a hit on attack, Guk may , grip, punch, or wuss slap. 1-2/3-4/5-6 on a d6. Victims who are gripped, will be drawn to his mouth and bitten, or asked a random bizarre question, 50/50 chance for either. Guk may not be reasoned with or negotiated with, he/it, knows no fear. Stinkfoot is a blend of halfling, and skunk. He is not that bright, easily startled, but not apparently hostile to strangers. In fact, he will become instantly attached to any group that shows him the least kindness. He is always hungry, and will stick with the party if given food. He will attempt to be helpful in whatever way he can. Stinkfoot wears backless short pants to allow his tail freedom and is covered in black and white fur. he carries a wood club as a weapon, and can also defend himself by squirting a foul musk like a normal skunk. Musk cloud, 2" by 2" by 6", save vs poison or lose 50% of strength and dexterity due to nausea for 2-8 turns. Stinkfoot appears harmless and will likely evoke feelings of benevolent condescension from the party. He has, however, absolutely no moral compass, and, if left alone with wounded, or otherwise helpless characters, will club them to death and eat them as soon as he becomes hungry. 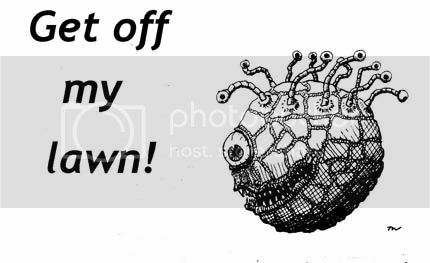 I thought I'd put up a copy of the beholder without any text, so that you guys can copy it and try out your own sayings. Remember, Eyegor means old school. Gustaf Tenngren, 1923 Grimm's fairy tales. I don't know which story those things are from, but I find them pretty awesome. 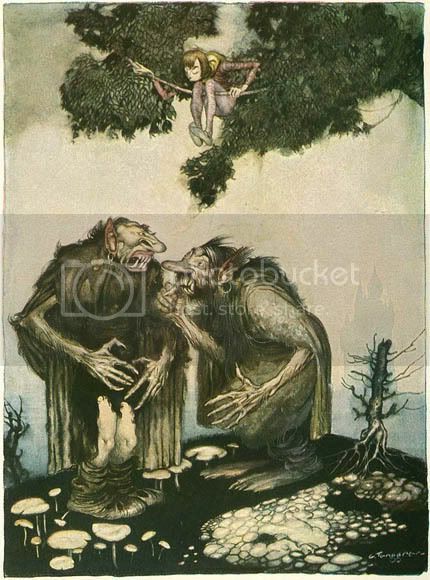 I'm thinking that kid in the tree is probably screwed, Grimm's fairy tales aren't like the precious snowflake stories of today, where every one gets a trophy and goes home feeling emotionally validated. That kid's gonna overreach himself and end up on a spit. I think I'd make them hybrid troll-ogers, Trolgers, yeah, I'm gonna have to write that up. But not today. I just put that picture up because I like to have one on every post. It just feels more complete to me. The think I wanted to post about is Hackmaster. Now, I know the grog-blogs and old school forums have kicked this game around and chewed over every minute part of it in our unending war of definition over what is and is not true to the original spirit of The Game. And, I'm not interested in fighting about it. All I want to do with this blog is throw stuff out there and hope it's useful to someone. I'm more of a gardener, or a maker, than a dogmatist. I think the best we can do to ensure the success of the old school Renaissance is to get as much material out there as we can. blog posts, free pdfs, print on demand stuff, whatever. I would like very much to be able to put up some stuff for sale after awhile, I've got several irons in the fire. We'll just see how it goes. Hmmm, I seem to have wandered away from my intent there. Anyway, I think Hackmaster is a joyous thing. sure, it's huge and unnecessarily rules heavy, but it's supposed to be. It's a parody game. It's AD&D full of jagermiester lurching down the street singing and belching and setting off car alarms. It would be an agony to run it by the book and I doubt anybody does, or did. Now that Wizards yanked the rights back from Kenzer, It's pretty much a dead game. Sure, Kenzer is coming out with a new edition, with all the AD&D stuff removed, and I'm sure it'll be a great game. Kenzer has put out alot of great material. I don't have a copy of Aces&Eights, their western rpg yet, but I've heard alot of good things about it. But the thing is, I don't need, or want any new fantasy rpg. D&D, the retro clones, are all I need. The abstract nature of the game means that I can stretch it to fit any genre I want, with a little elbow grease. And that's just fine. I would rather build an imperfect thing myself, and learn in the doing, than have it delivered to me on a platter. I just can't value a thing that didn't cost me any effort. I've wandered again, and I'm not even drinking. It's distracting to do this while having conversations in another window. I wrote most of a module for Hackmaster before I realized I'd never have anyone to run it for anyway. It was a take off on The Island of Doctor Moreau. Mad transmogrophist wizard, lots of bizarre monsters. I'm just going to put up some of the monsters for you guys to use if you like. Remember, it was written for Hackmaster and so in keeping with it's over the top style. The Ditch Archer is a smaller surface dwelling cousin of the cave fisher. An ambush predator, the ditch archer secrets itself on hillsides, roads , and in forested glens to wait for likely prey. Instead of the adhesive pad of the cave fisher, the ditch archer shoots a sharp, barbed harpoon on the end of it's long filament line. The bony harpoon will embed in the victim,doing, 1-4 point of damage immediately, and the same each round if the speared creature resists being hauled into the archers waiting jaws. As the archer is around three hundred pounds on average, it will choose smaller than man-sized targets if possible. If not, a hungry archer will not hesitate to shoot for larger prey. The Orctiboar is to orcs as the manticore is to men. It has the body of a huge boar, the wings of a gigantic bat, and the enormous, slavering head of an orc. The orctiboar sees all smaller creatures as food. It especially enjoys rooting out halflings, gnomes, and goblins from their burrow homes. Anyone face to face with a bellowing orctiboar must save vs poison, or be overcome at the horrid stench of it's foul breath. Those who fail to save are incapacitated for three rounds with retching and unable to fight. I have many more I'll post next time. now I think I will have that drink. 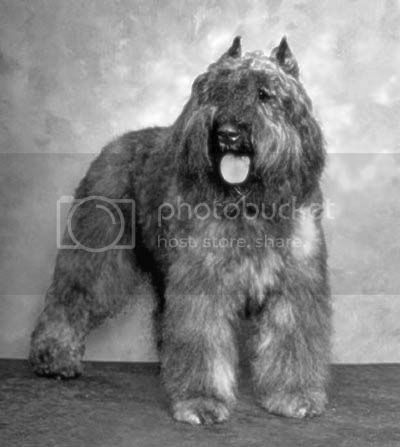 Dwarves breed these stocky, powerful dogs as guardians of their strongholds, and as helpers in their mines and tunnels. Intelligent dogs with excellent morale, tunnel dogs make steadfast companions. Highly prized by the dwarves, they are rarely sold, and then only for a great price. They are sometimes given as gifts to those who have done the dwarves a very good turn. A heavy coat of wiry, nearly metallic fur gives tunnel dogs good protection from attack. Also, they are often fitted with studded leather or other types of armor. Dogs working in mines, or accompanying expeditions wear saddle bag-like packs to carry supplies. A tunnel dogs sight is weak, but they have excellent hearing and sense of smell. A party including tunnel dogs is rarely surprised by normal foes. A tunnel dog has no fear of fire, being raised with forge and foundry, and will carry a lantern or even a flaming torch in it's jaws if directed. The dogs work in concert with other dogs or their masters in attacking intruders. A tunnel dog will bite and clamp down with it's jaws on the hands or other extremities of an attacker and hang with their full weight, wrenching and twisting in an effort to pull down the target creature. The victim of such an attack must roll under it's strength score if less than twice the dogs weight, or be pulled down to the ground. There to be easily dispatched by the dogs masters. Like dwarves, tunnel dogs love both beef, and beer. Who knew? It makes me wonder what sort of game Van Gogh was running out there in the french countryside, Call of Cthulu? And what about Dali? Mage the Ascension or maybe Paranoia? Stay alert! Trust no one! Keep your melting pocket watch handy! The current header is a nice little sword and planet style drawing by Roy Krenkel. In case you wanted to know. I clipped a piece from the Erol Otus cover illustration for the 1980 Dungeon Masters Adventure Log. I love this illustration, it really gives you the feeling I associate with all the megadungeon discussion that's been buzzing around all the grogblogs lately. I like how the torch flame is washing across the ceiling of the corridor. I'll post the unclipped version after I rescan it. Somehow, I deleted the original. A while ago, Jeff Rients of Jeff's gameblog was talking about one of the games he ran at a local game store, and he mentioned the deck of random items that he had beginning characters draw from. I think that's a great idea, and I copied his list, and then lost it. I do that. Jeff put his list on 3x5 cards and had the players draw from a deck, giving them some random thing to begin their adventuring career with, regardless of it's usefulness. I think that's the sort of idea that gives life and a sense of depth to the game. Just as in real life, you pick up all kinds of odd crap as you go along. May Istus smile on you. Roll 2d10. And thank you for the idea Jeff! 1. Grandfather's broadsword, plain but quality. An unknown script runs along the inner side of the scabbard. 3. 100 feet of rope. 4. jug of pickled eggs. 5. A healing ointment of your mothers, heals 2hp per application. Four applications. 6. A sock full of sling stones. 7. A cat, it followed you into the village. 8. A scroll of deposit worth 168 gold pieces if presented to a member of the Auric Brotherhood of money changers. 9. A shortbow and quiver of eight arrows. 13. An extra pair of boots. 14. Two men-at-arms sworn to six months service. Armed with Chainmail, shield, and spear. 15. A hooded cloak with a dozen inside pockets. 16. A golden signet ring, origin unknown. 17. A dwarven tunnel dog, loyal and well trained. A gift from "uncle Guorgi". 18. Ten sticks of chalk. 19. A hide of fine leather. 20. A dozen hard sausages. 21. A five gallon cask of usk brandy. 22. Four yarpick thorn javelins. 26. A set of four horse shoes. 27. An ink pot, quills, and sheaf of paper. 28. A small bag of salt, and one of pepper. 30. A dozen 12 hour candles. 32. A tough leather sack. 33. A pound of goat jerky. 34. Father's old round shield, (medium), beneath the boss is the sigil of Heironious, valiant conduct by the bearer may draw the eye of the God. 35. A map of the kingdom. 36. A bundle of letters to be delivered. 40. A trolls hand mounted on a three foot rod. It will grasp objects, or make a fist. commands, grabit, leggo, fist. You found it in the Forrest gripping a tree branch. 41. A bestiary, allows the player to ask a question of the DM about any creature listed in the monster manual, fiend folio, or monster manual II, during the game. 42. A broad belt with bronze plates. 43. A long stem pipe and bag of pipe weed. 44. A hand axe and belt sheath. 45. A stone fire pot. 47. A very nice squash. 48. A sack of nuts. 49. A large copper pot. 50. A full face mask. 52. A roll of halfling made gardening tools. trowl, fork, rake, seed hole spike. 55. A set of four chisels. 56. A scroll tube containing the deed to the Riven Tower of Ghasdac. 58. A roll of ten torches. 59. A sack of dry beans. 62. A bag of apple seeds. 63. Flint and steel fire starter set. 64. A bottle of perfume. 65. Forty feet of steel wire on a spindle. 67. A game of stones with a cloth board. 70. A heavy wool blanket. 71. A wax paper packet of blue dye powder. 72. A pair of bear fur knee breeches. 74. A high quality sharpening stone. 75. A bolt of undyed linen. 77. A small sundial on a necklace. 78. Frolees five page guide to mustaches and beards. 79. A six inch Crystal lens. 80. A small silver mirror. 81. A large loaf of tasty bread. 82. A Ring of Luck, +1 on all saves, roll again on this list. 83. A fishing pole, with line and hook. 84. A tortoise shell hair comb. 86. A copper tongue scraper. 87. A pair of heavy leather gloves. 88. A bag of candied fruits. 89. An adventurous pixie has decided to become your henchman. 90. A wand of eye poking. four charges. It will unerringly poke out the eye of target creature within arms reach. no roll needed. 91. An excellent Sheppard's pie. 92. A large bar of hard soap. 94. A fine fighting axe. 95. A small bag of uncut semi-precious stones. 96. A dozen glow wasps in a round wire cage with handle. Equal to torch light at night. Require food and water daily. 97. A scroll of sheet music. 98. A chirugeons bag of knives and tools. 99. A quart of honey. This is a small decorative illustration by Virgil Finlay. I really never get tired of his work. He illustrated many of the great stories, first published in the pulps, which formed the literary foundation that Gary drew on when creating our game. I like the idea of something that appears beautiful and innocuous at first glance, actually posing a deadly threat. The more harmless it appears, the more horrifying the attack becomes. It also really throws off the players, " but it's only a little bunny, I'll chop it's head right off!" Hit dice: 1, for "to hit" purposes. Beautiful black and silver butterflies living in colony's of up to six hundred individuals, Glitternights pose a deadly threat to those unaware of their true nature. Glitternights roost in dark places during the day, in ruins, hollow logs, or underground, only coming out on moonless nights in order to feed. When a Glitternight colony finds a victim, they flutter around in in a dense, flickering cloud, shedding a silvery narcotic dust from their wings. Any creature inhaling the dust, must save vs poison, or fall into a deep hallucinatory trance, transported by visions of the fantastic and insensible to all else. As the victim stands entranced, the Glitternight colony will settle over him and drain blood with their needle-like feeders. This will do damage at a rate of three hit points per round. They will continue feeding until they have reached a total of twenty five hit points worth of blood, or the victim dies. If the colony is satisfied before the victim dies of blood loss, they will return to their roost, leaving their meal provider to wander in a narcotic fugue for a further two to four hours. Bright light, such as a Light spell cast upon the victim, or a torch held close, will force the Glitternights to abandon their feeding. They will also not attack those characters actually bearing torches, or near a campfire. They will, however, swirl about just beyond the edge of the light and attack any who leave it's protection. Some, brave or desperate souls, hunt Glitternights for the narcotic dust they produce. By placing fine nets or bags over the exits of their lairs, they hope to catch them as the come out to feed. This is a dangerous occupation, however, as the hunters must wait in darkness. The butterflies will not come out if any light source is present, but mistiming the placement of the nets will lead to disaster. Glitternight dust will bring a great price if offered to the right sort of buyer.